In 2008, I've taken tasting notes on nearly 400 wines. I enjoy a wide variety of wines and am especially excited to find good bargains. In fact, my colleagues and I at The Wine Cask Blog are particularly value-oriented. We believe the world of wine delivers tremendous value if you're willing to search out new regions and new varietals. This might be the best value I've ever found. Incredible stuff for the money! One of the biggest, fruitiest wines on the planet. Make sure you're in the mood for this style! Here's the incredible balance of ripe fruit and underlying tea notes. Move over Shiraz! Really smooth, rich, and round. Cab Franc in a modern interpretation! I keep finding New Zealand Sauvignon Blancs that knock my socks off! A composition of wild berries and other exotic layers! Dark, dense, and totally Cab. One of the new "best values" from Chile! Ripe but also elegant. Don't miss this one! A great representation of Malbec at an affordable price! Exotic and beautifully made- and for only ten bucks! In many ways, this is a classic Brunello with cherry, sweet spice, and an earthy layer. I love that it's from the 1995 vintage, two years before Brunello exploded in popularity and price with the 1997 vintage. If you have this, drink it soon. It's fully mature and ready to go. I only had a half bottle to enjoy with Billy of this blog. We paid $25 in a shop that always seems to turn up "lost treasures" covered in dust. Unfortunately, this was the only one. Also read Billy's review of this wine below. Raise a glass! This is a good solid Chateauneuf. It's not a modern interpretation, but rather a traditional style with some real heft and nice layers. I paid around $35 for this wine several years ago. Raise a glass! Palate: very dry, sprightly citrus with robust acid for strength and structure. Finish: lively finish of green grass that is over too quickly. 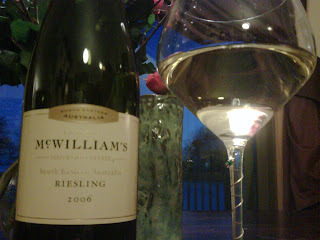 Overall: I am blown away by the quality of this Australian Riesling. I paid 6 dollars for this on sale but it usually doesn't go for more than 12. This is an excellent value white. Absolutely brilliant in its simplicity which adds elegance. Perfect for parties and entertaining. (NW) of this blog stumbled onto this wine at a local Boston shop where he figured the proprietor must have found a case in some out of the way place of the business and seeing the year of production, assumed it would be long past its prime so stuck a $5 price tag on it. (NW) served this to me bagged and asked me for my thoughts. This wine was obviously old with a murky. garnet color but still holding to the rim. It's bouquet on opening was pretty obnoxious with traces of egg nog and wild grape but mostly acetone and a medicinal ucky smell. Still--there was something lurking below these awful odors that kept me interested. I had no clue about what the wine might be but I said, "It is 20-30 years old." (NW) just smirked. As minutes passed by, the wine was changing and the hideous aromas on opening were dissipating revealing an amazingly nice, sweet wild cherry and evergreen beneath it all. As I filled my mouth and swirled, the anticipated nastiness of a wine long gone was not forthcoming. Instead there was an intriguing taste of stewed prunes yet with lively cherry fruit underneath. It was fully integrated, balanced and all around superior. If I had to rate this wine I would give it a 94 and I rarely ever do that! I was flabbergasted and as we allowed the wine to breath, it turned out to be one of the best wines I have had in several years! So it was a risk and for $5 you would fully expect it not to even be palatable but sometimes life hands you a bouquet of roses. Raise a glass to this exciting and wonderful find! Palate: great mouth feel even after 13 years. Quick drink and the character fades, but hold it in your mouth and there it is: Huge character feel, complex and layered structure. Finish: Delightful and silky-spicy finish. This was a great half-bottle find that NW and I found tucked away in a corner of a "reserve" room. For 25 bucks it was a steal. A beautiful treat that is showing age but still exquisite. Palate: past prime. Overly tannic at front and unbalanced acid structure at the back. Finish: hints of structure in the finish but never really delivering. Overall: disappointing. However, NW of this blog and I believe this is due more to the fact that we found the wine on the shelf of a non-temperature controlled store where they have 95 degree summers and 0 degree (F) winters. Either way, Raise a Glass! Finish: Lingering warm finish of cracked black pepper. Overall: gorgeous color in the class. This is the simple "sometimes" Pauillac label from Chateau Pichon-Longueville. At 37 bucks it's priced for the name rather than a comparable 2005 quality with another label. At half the price, this would be a wonderful find. Still, I am raising a glass of this sometimes label from Chateau Pichon-Longueville. Nose:Earthy strawberry, cherry(?! ), layer of tobacco, dirt. Palate: even balance, soft in mouth, mid palate flavors of socks and warm oaky spice. Overall: I paid $26 for this earlier this year. The wonderfully long finish and delightfully earthy nose set this Premier Cru Bourgogne from the vineyard of Les Champans apart. Layers on the nose are complex and engaging. With time it opens even more. In the glass it still shows a very youthful clear plum-purple. Others have called this an "entry level" pinot noir. I call it a wonderfully accessible pinot noir made with enough respect for the land that it allows the earthy flavors to come through. Delightful. This Napa wine is deep garnet to the rim and needs air! The bouquet is tightly wound but will open with an hour or so of breathing. Palate-mature, anise front and closed due to tasting on opening; numerous elements fighting to break out. Sweet cherry flavors with black olives and rose petals. This is tasty and was a nice pairing with our rib roast. This wine will set you back about $40. Raise a glass. If you remember nothing else about wine in 2008 please try to remember this: Champaign is a sparkling wine that is made in Champaign, France. Everything else is sparkling wine NOT Champaign. Okay, this Champaign called White Star runs around $40 and is a light golden with a bouquet furity nuttiness with pecans and vanilla cream. Palate--Nice pin prick bubbles with hints of off-dry grapefruit, nuts and integrity. An easy drinking Champaign; raise a glass. It is a lighter garnet color with nice fruity bouquet of berries and cedar with cherry predominating. On opening, it is a tad watery but nice flavors of cherry and decent structure but needs to breathe. After 4 hours of airtime, cherries and leather with a touch of wood but finishes a mite quickly. It is at its prime but will hold for another couple years I would guess. I paid $40 for this on a trip to the mid-west a couple years ago. It is a solid wine but nothing special and for $40, you can find something special. Never-the-less, raise a glass! It is December 25th and preparations are underway allowing my wine to breathe before the serving up of the "roast beast." I cannot divulge what I will be serving at this time as (NW) will be here shortly also bringing a "special" bottle for the occasion. Neither of us knows what the other is serving. You can read all about it after we have celebrated the arrival of the greatest gift to mankind--Jesus--Immanuel--God With Us. Merry Christmas to all, in all parts of the world. With all the wines that are "out there" you would think it would be nearly impossible to pick the best wine value of the year. First some explanation: To be fair, in order to truly designate the BEST wine of the year one would have to have tasted EVERY wine in the world. Impossible of course. So my pick is more accurately the best wine value of the year out of all the wines I have had this year which is around 350-400 different wines. Remember this is the best wine "value." And that wine is; tadum-tadum..... Cline Zinfandel 2006; at a market price point of around $9 with bargains to be had at places like Sam's Club where this wine costs just $7.80. This is Cline's production level Zin (not their ancient vine Zin) and is the cheapest zin they make. For this price you get a classic varietal with the chracteristics of the Zinfandel grape, bursting with a balanced fruit forward presence, and just such a pleasing berry rich palate that is good all alone but even better with a nice grilled "anything." Pair it with some bolder cheeses; italian food, pasta with garlicky marinara; it works with them all. I don't drink too many repeat wines since ther are just so many wonderful adventures waiting and since, with a few appreciated exceptions, each of us at the WCB pays for our own wines consumed, we want to broaden our palate's discernment. Yet I have consumed at least a case and a half of this zin this year and past year's vintages have been pretty much equally good. So raise a glass and take advantage of this nice and inexpensive wine! (Billy) of this blog surprised his "old man"--yours truly--by showing up in church, with my grandson in tow, from Minneapolis. Christmas surprises are great! We had two wines "bagged" (blind tasting) by my wife and we then reviewed them. The other wine is below! Raise a glass to Christmas fun! This was the lesser of the two wines with same presentation as the wine I reviewed below this wine. It is tighter on the nose with slight cherry notes and alcohol out of balance. Palate--A little more finessed than the KJ Zin below, but another boring wine that you would expect to find in the $10 price however this one cost more than twice that. So I give them both a pass and say raise a glass but look for better values like my "Wine value of the year" just above this entry! Opaque red hue to the rim with residual purple. Blueberries on the bouquet, new world sweet slight cherry notes. Palate--big sweet fruit fighting against alcohol with a slight licorice note trying to emerge. Rich plum finish and sour cherry notes. This was a blind tasting against another unknown wine. My conclusion was, "quite unremarkable tasting like any other ubiquitous $10 wine." Too bad this wine cost around $16. Jellied cranberry hue with purple rim. Tart pie cherry bouquet with sweet fruit underneath. Palate--spice front; watery feel, nice berry flavor but somewhat closed. Finishes with sour cherry fruit. Okay , it is only $9 and it is okay at that price point and perhaps it is that I just don't care for Malbec but this was just so-so. But if you like Malbec, I'd still recommend something else like Neu Direction or Trapiche's Oak Cask. Raise a glass! See the entry for Thanksgiving and Merry Christmas! My perennial favorite this sparkler is deal at $14 (Sam's Club). I see it as high as $20 and its worth it at that. Nose is full of citrus and creme brulee. 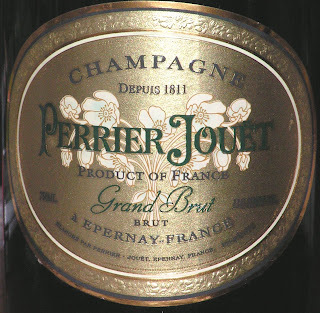 The palate has fine bubbles with a juicy citrus core with a light tart mandarin orange note. As always, my favorite, inexpensive sparkler so raise a glass. A pretty light cherry pour with really nice honest pinot aromas of tart raspberry. Palate--alcohol is a bit overwhelming and flavors a bit thin with light raspberry. For $10, this wine is drinkable and varietal. Raise a glass. Super sweet, grassy nose with vanilla cream, apple pears and a touch of tropical fruit. Nice. Palate--nice presence with solid acid foundation; tasty vanilla, tropical fruit salad with a fruity finish. Very nice. At $9, raise a glass. Bright Cherry hue with pronounced fruit filled bouquet of cherry, slight green pepper and a touch of cedar with tart cherry later on. Palate--herbal but well integrated cherry and tart cherry flavors with light finish. Not bad but certainly not "wowing." Served with Thanksgiving dinner and our guest loved it saying it was the best wine they had ever had. Beauty is sometimes in the eye of the behold--or in this case, in the tongue of the taster. At $12 on sale, raise a glass. A complete Zinfandel is a special thing. This wine is rich and layered, with interesting aromas and a long finish. It's a terrific wine year after year, and this is probably their best vintage ever, but a Wine Spectator score of 93 points? That's a big number. Still, I enjoy this wine every year and recommend you seek this out. I paid $22 at one shop and $20 at another. If you find a really good price and enjoy Zinfandel, you might want to think about buying a case. It will cellar well for at least a few years. I have several previous vintages in my cellar and they are drinking nicely. Thanks for another terrific Zin, Seghesio! Raise a glass! 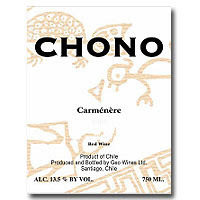 I'm glad Chile is having success with Carmenere. It offers a dark, exotic wine at a reasonable price. For something off-the-beaten-path, reach for a bottle of Carmenere next time you're in a wine shop. Spend around $10 or so, like this one, and enjoy! The dark fruit and herb profile of this wine are really interesting for a wine in this price range. Other Carmenere bottlings also end up with coffee flavors. Check it out- and raise a glass! 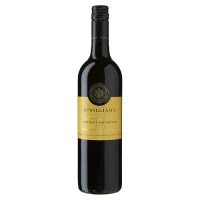 Black cherry pour with ample rich plum and black cherry bouquet full of ripe fruit. Palate--spicy front with some heft yielding to nicely integrated, extracted plummy fruit with character in an easy drinking style. Finishes with some spice and fruit galore. I paid $8 for this on sale though I don't know what the "normal" price would be but my guess is around--drum roll please.............................$10! Gee, how'd I guess. At any rate, this is a value wine at either price so raise a glass! I must admit, I skipped over the Beaujolais Nouveau this year. I guess I just wasn't in the mood. 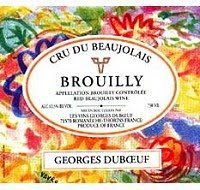 Instead, to support the wine makers of Beaujolais, I bought a couple different bottles of Beaujolais Cru. Where Nouveau is so hit or miss, the Beaujolais Cru is almost always hit. These wines are tremendous values and offer a versatility that is almost unmatched in the wine world. They are rich but light, balanced and harmonious. This wine is silky and composed, with some trademark Gamay notes and a hint of neighboring Burgundy. I paid $12 and often see this wine range from $12-15. Raise a glass! This is a lean wine that has some fruit, floral, and herb qualities. Overall it's not very good and lacks depth, but I'm not going to pick it apart when it's in the value aisle at $7 or so. Spanish wines can be excellent values, but in this case I recommend you spend a few more dollars for something better. In fact, Borsao's red wines in the $12-15 range are much better. Raise a glass to Spain! Overall: a nice and pleasant Beaujolais Nouveau this year. The best of the bunch I had tasted this year. Nice in the late afternoon before dinner as a cocktail. Unpresuming but enchanting. Nose:fruity nose of plum and cherry and some hints of savory spice. Palate: decently crafted with moderate tannins and a good mouth feel. Finish: big cherry fruit finish that ends abruptly. Overall: I ended up paying only about $6.99 for this (in a buy one get one free sale). For that price I cannot complain. You can tell it is a 10-12 dollar wine but it is easy drinking and the quality is good for the price. Palate: small bubbles that are stumbling. Off dry. Overall: this Italian sparkling comes with a bottle top that is reminiscent of the Steve Martin, Kermit the frog, Miss Piggy scene in The Muppet Movie. A distinctive nose that promises a good time. We paid about $13 for this bottle. Nose:complex character, warm white soft cheese nose, soft floral scents, and cool bread dough. Palate: Dry, good and noticeable structure. Delicate bubbles. Finish: lingering and tapering. Dry with green apples and floral citrus. Overall: The feature of the evening. Exquisite. I paid aprox. $45 for this. It's such a treat and a distinctive profile. Please treat yourself to a bottle of this champagne this Christmas. Finish: finish is understated with green apple being the most prominent with a nearly puckering dryness. Overall: quite nice for an affordable dry sparkling wine. This one paired best with the Ghirardelli dark chocolate with raspberry squares. Finish: nice finish with bigger citrus coming back and a dryer texture. Overall: a fun bubbly from the usa. This goes best with the milk chocolate with lavender tonight. We are hosting a bubbly and chocolate tasting this evening so I'll be blogging all the bubbly we taste. The chocolates here include d'Oliva Bar (olive and white chocolate), dark chocolate and chili, milk chocolate and lavender, white chocolate and simple dark chocolate. Dark purple/garnet hue with bouquet of rich inky dark berries with dried cherry aromas. Palate--light spice with tart cherries and tasty berries. This blend by Delas is 75% Syrah 25% Grenache favoring the Syrah yet with Grenache fruity undertones. For $11, it is pretty good drinking. Raise a glass! Presence of blackcherry with garnet rim and rich blackberry/black cherry bouquet with notes of green pepper and fruity black licorice. Palate is finessed with rich dark fruit, integrated structure, smoke, dark berries. fleeting mint and eucalyptus and a smokey finish. this is apretty tasty cab and well made. I paid $22 for it in Los Angeles at a Trader Joes and am grilling filet mignon at present to go with it. Raise a glass to my new grand daughter which is why I am in LA. Palate: light body. light but balanced acids and tannins with a touch of acidic bitterness at the back. Finish:Delicate with strawberries and some acidic bitterness again at the back. overall: Nice but not the best. I paid for this ($85) at a hipster restaurant in San Fran. Expected better for the reputation. Palate: smooth berry and tannic. Fine soft balance. Finish: green finish with warm cherry and dry tobacco emerginglate. Overall: a very finely crafted merlot. Nose: deep rich nose. Tight but will open with time. Peppery with Kola nut and berry. I paid about 31 GBP (about $45 usd) for this at an upscale London restaurant. Black cherry hue with light cocoa and black cherries fighting through volatile alcohol. Palate--zesty flavors of ripe fruit of plum and black cherry, milk chocolate, and a pronounced smokey finish carried on a watery textured foundation. Tasted a little too warm but not enough to negate review. I paid $10 for this on sale from $15. It is a typical $10 Zin; if I paid $15 for it I would be annoyed. On further reflection and time to breath, it is a pretty decent example of a Zin at this price point. Some spice, good fruit, and an easy drinking pizza/spaghetti wine. For the price, try Cline 's red label zin for around $9. Raise a glass. It's always a treat to see this wine on a restaurant wine list. I recently paid $88 for the pleasure of popping the cork at a casual, upscale restaurant. (The retail price is around $45). While complex and fragrant, the 2005 is a bit tighter and more tannic than in prior years. This is the third vintage I've sampled, and although it's the least impressive, it is still a terrific wine. Raise a glass! This wine delivers a nice combination of light, delicate flavors along with rich spice and vanilla. It is well layered and should please Pinot lovers. I stumbled on the bargain of the century when I picked a couple bottles of this out of the bargain bin for $6.50 at a local grocer. The wine usually goes for over $20. Raise a glass! The Wine Cask was sent this wine for review by the good folks at Sam's Club. It represents an embarkation to "Fair trade" products which purchases products from people who are committed to paying their workers a "fair wage." This Malbec is from the Mendoza area of Argentina which is truly coming of age with respect to this grape. The wine is produced by the co-op Vina de la Solidaridad with Bodega Furlotti. The wine is a hefty purple hue with room filling, medium sweet aromas of dark berry jam and some pleasant aromas of a tinge of black licorice. This wine has plenty of life in it but is integrated and drinking well right now. Palate is extracted with big dark fruit, some tarry notes and a touch of smokey or burnt wood--for the uninitiated, these are positives--and finishes with a lingering light plum ending. The reference price on this wine is $10 and for the price, this is a decent value so raise a glass and give it a swirl! Medium ruby hue with nice tart pie cherry bouquet, earthy, pipe tobacco and some structure. Palate--sour cherry with steely mid palate, black pepper and light sour cherry flavors--needs to breathe! With 45 minutes of air, cocoa predominates over the sour cherry. It is still a bit out of balance with respect to its tartness but steely light fruit is okay drinking. You'll pay around $15 for this wine and a different year would probably prove to be more rewarding. Raise a glass! A weekend blow through to (NW's) place had us drinking through a few bottles from his "informed" cellar. (NW) of this blog, picked this up several years ago and laid it down. It comes from the St. Julien section of Bordeaux and is noted as a premier great growth year after year. Nose is big cigar box aromas with touches of leather and of course cherries galore. Palate--even at 13 years old, this wine still has some maturing to do with slightly chewy tannins, which lay out the cedar foundation with bright red fruit, plum. (NW) paid around $50 this when he purchased it but you won't be able to touch it for that now. Raise a glass for sure! I grabbed this for $9 as it was a "Best Buy" in one of my wine mags. It is light garnet in color with fruity, nice bouquet of black cherry. Palate--Lt. bodied with initial spice, licorice, some wood and a smoke finish. Sounds better than it really is. I didn't care for it as an example of Syrah. It's okay but if you want Syrah, be willing to pay about twice what I paid for this. Check out Santa Barbara Syrah's for nice drinking and raise a glass. I am a big fan of Rosenblum zins so when I saw this one in a store next to the ubiquitous "Vinter's Cuvee" I grabbed a clerk and asked how much? The led to a 20 minute hunt to figure out where the wine cam from as they had no record of it, and neither they, nor I had ever heard of it. It was determined that it was mispacked in with a case of the other zin mentioned so they gave it to me for the price of "Vinter's Cuvee." I grabbed two bottles at $10 each and thought I probably scored a "find." Well, I was wrong! It is a lighter cherry red hue with raspberry and berry nose. Palate is watery with fleeting flavors that are just so, so. My wife said thee was loads of charcoal and smoke. At any rate, this is a wine to be passed up! But don't let that discourage you from trying any one of the many Rosenblum single vineyard Zins. They're delisicious! This wine and its red counterpart are always nice values. This white blend from the Cotes Du Luberon is a light golden with sweet almost perfumy bouquet of vanilla, red apples and pears. Palate--lively acidity, light citrus, pears and crisp clean finish. Blended from 4 different grapes, this wine is just a decent wine and drinks well by itself yet handles the right foods as well. I find this wine most everywhere in the $6 (when on sale) to $8 and again--this and its red version are writh keeping around for lighter drinking that won't break the bank. Raise a glass! Good friends treated us to a couple of bottles of this wine. It's drinking really well right now and is enjoyable because it's so relaxed and polished. The flavors integrate beautifully, and the texture is nearly perfect. To purchase this wine at auction or from the library collection of a fine wine merchant, expect to pay around $150 per bottle. As one of the Grand Cru Classe wines of St. Emillion, this wine has the reputation of aging quite well. Typically a Merlot-based blend, it has developed a strong reputation and a strong following for decades. Another Thanksgiving day is quickly upon us. Below is a re-post by (NW) that is helpful as you navigate the vast choices upon you for this festive day of food and reflection. With all the gloom and doom in the news one might think there isn't much for which to be thankful. That couldn't be further from the truth. Wine can enhance a Thanksgiving meal in many different ways. Realize that you have many options and don't fret over exacting your wine pairings. With all the flavors and various dishes, a number of different wines will work. Just enjoy making wine a part of the festivities. Raise a glass! Hooray for Beaujolais Nouveau day! 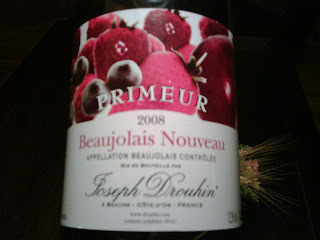 The Primeur 2008 Beaujolais Nouveau from Drouhin this year is a solid table wine that is easy to drink and easy going. It meets expectations without letting down. Shows good character. I paid $16 for the bottle. Beaujolais Nouveau Est Arrive! I bought the first bottle at our local store and am serving tonight with raclette of salmon and baby spinach with dill cream cheese. 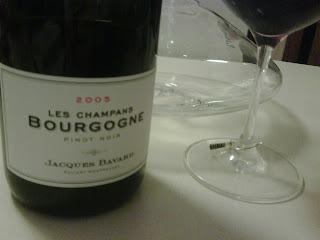 The wine is purple--of course-- with a fairly big bouquet of sweet strawberry that is nearly perfumy. Palate is a little chewy with light strawberry flavors and a slightly steely finish. This is pretty straight forward Nouveau although better than last years! I paid $9 for it a the super market. 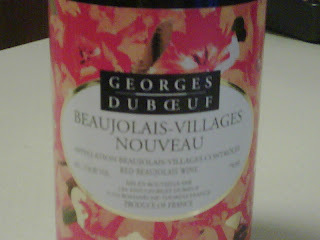 Look for other producers and also look for Beaujolais Villages Nouveau and give them a whirl. Let us know how you like them--or don't and raise a glass! No kidding- this wine has a lot going on! While a precise description of all the layers might be elusive, there's clearly nice depth here. I'd summarize this wine by saying there's a bright fruit and floral quality that is offset by a dark, smoky quality. Amazing combination! Great Southern Rhone wines can pull this off. Grab a bottle of Chateauneuf-du-Pape or Gigondas. 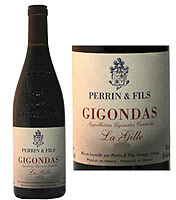 Gigondas is simply another classified area near Chateauneuf that is considered a kissing cousin at lower prices. I paid $22 for this wine, which is the equivalent of stealing. A Chateauneuf of this caliber is $50 or more. I believe Wine Spectator awarded 93 points here. Raise a glass! This Thursday--TODAY Nov.20-- marks the annual, world wide release day of Beaujolais Nouveau. It is a celebratory affair in Beaujolais when a very simple wine made from Gamay grapes is released having barely enough time to ferment. It is merely weeks old from the time of harvest to the time of release. Typically B. Nouveau is simple, fruity guzzling wine at its simple best. Brimming with strawberry and/or raspberry highlights it is wine made to drink immediately and in fact in all likelihood will have gone by if you hold it until this time next year. So find yourself a couple different bottles from different producers and compare. You can expect to pay around $10-$12 a bottle so raise a glass! (I JUST bought a bottle of Duboeuf and it cost me $9. If you would, let us know what you think of the particular Nouveau you slog down! Watch for the review of the one I just bought later on this evening and raise a glass! This New Zealand Riesling is a pretty golden with a sweet, powdery honey bouquet that is enticing and reminds me of a nice Chenin. In the mouth this wine is at first vibrant with zing and active acidity. The juicy core of lime and citrus is full of life. A good food wine or as an aperitif. You'll pay a little more than you might usually pay for a bottle of wine, but this is a nice wine even at the $20 price point! Raise a glass. Look for some classic Brunello character in this wine, with rich cherry and spice layers set on an earthy, chewy backbone. Also, expect to pay about $60, which is now a very typical price for a non-riserva Brunello. While this wine is showing some nice complexity of flavor, I recommend you continue to cellar it for several more years. If you're at home and want to drink it now, simply decant it, let it sit, and sip it closer to room temperature than you might with other wines. Big peary nose with an under layer of vanilla cream and something that I don't have a descriptor for. Palate is lively with nice acidity and clean flavors of citrus and minerals and a fruity, pear finish. This is a nice, clean wine that will pair well with buttery, rich foods. Raise a glass and thanks Stilletto! First--Ripasso is a Valpolicella wine created by fermenting wine and then refermenting the wine with the unpressed but drained skins and lees left over from making Amarone. 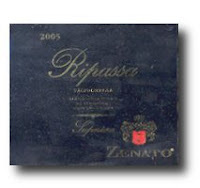 Ripasso is made by a number of producers, often using their own variations of this basic method.This wine has a heavily pigmented hue like a Syrah with a deep black cherry presence. Bouquet is brimming with ripe rich berries and light spice. Palate--rich tannins with steel and minerals, forthright, juicy, fruit and very tasty. This wine is voluptuous, velevty and plush; a pure wine. A bit pricey around $22 but well worth it! Raise a glass!